The stethoscope cardiology offers high acoustic sensitivity for exceptional performance when doing general physical assessment. It features dual tunable diaphragms and an updated design that is easier to clean and maintain. 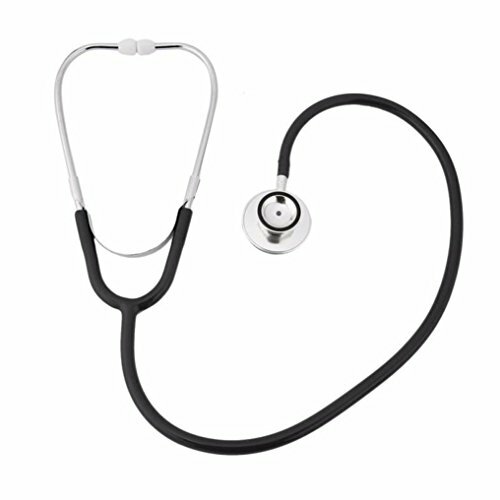 This stethoscope is used by students and medical professionals alike to identify, listen to, and study heart, lung, and other body sounds for physical assessment, patient monitoring, and diagnosis and instructions. MATERIAL QUALITY - Our product is 100% brand new with good quality, strict quality control, performance indicators, and manufactured to the higher industry standard. AUSCULTATION HEAD - A thin, single auscultation head made of aluminum alloy, effective auscultation interface with ultra-thin fiber vibrating diaphragm, can enlarge the heart lungs sound, and can detect high-frequency noise. KEY FEATURE - The oblique-shaped flat auscultation head is easy to insert sphygmomanometer (table) arm belt. Very suitable for blood pressure measurement. EAR HANGING - Ear Hanging is made of chrome-plated aluminum tube and spring steel plate assembled, with PVC earplugs. The spring steel sheet uses the manganese steel sheet material, the hand may adjust according to the different face shape size freely, the soft ear canal kiss dense combination, the soft comfortable, does not have the pressure feeling to the middle ear bone. SOUND-CONDUCTION TUBE - The Y-type lead-tone tube, using PVC material, not easy to break, anti-aging, no sticky, high density, and does not contain allergic latex ingredients. If you have any questions about this product by Khannika, contact us by completing and submitting the form below. If you are looking for a specif part number, please include it with your message.